All breaking news, they happen on Twitter. Even before they hit the TVs and radios, you would have known about them a few minutes ahead of the rest because you’ll hear them first on Twitter. 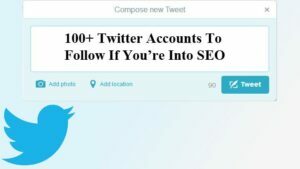 Twitter is one of the best ways to be updated with search marketing techniques, tools and insights in the SEO industry. You can easily connect with like-minded people and be immediately informed of nationwide and worldwide trends through its hashtag technology. Stay current with what’s hot and what’s not. Here are 100+ Twitter accounts to follow if you’re into SEO. 2. Lisa Barone. Vice President of Strategy at Overit.com; Co-founder and current Chief Branding Officer for the team of SEO consultants at Outspoken Media, Inc.; noted search and contributor/writer at Search Engine Land, Search Engine Watch and Copyblogger; most known for her accept-no-substitutes style of liveblogging at popular Internet marketing conferences. 11. Matt Cutts. Head of the webspam team at Google. 12. Joost de Valk. Founder and CEO of Yoast.com; founder of CSS3.info, the biggest CSS3 resource on the web; developer of many WordPress plugins and considered as an authority in WordPress and website optimization; well-known SEO consultant and public speaker; contributor/writer at Moz. 14. Rand Fishkin. CEO and Founder of Moz, one of the marketing world’s fastest growing software company based in Seattle, WA. 17. Danny Goodwin. Associate Editor at Search Engine Watch. 19. Ross Hudgens. Founder of Siege Media, a content marketing agency based in San Diego; called a “big thinker” inside SEO and link building circles; contributor/writer at Moz, Search Engine Journal, and Search Engine Land. 28. Duncan Morris. Co-founder and CEO of Distilled. 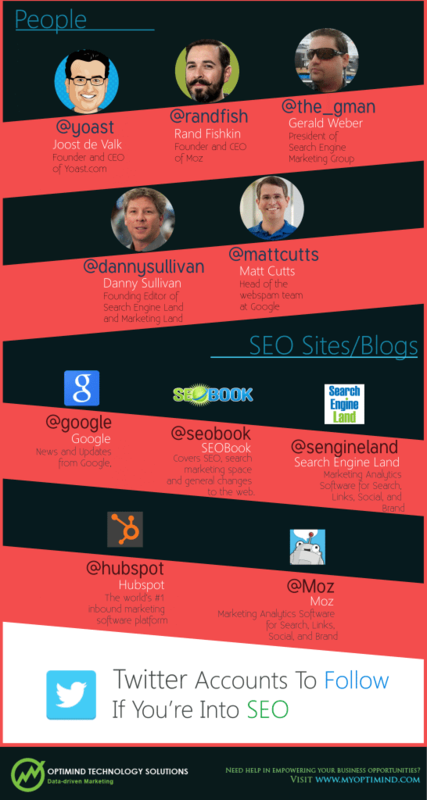 Top SEO Blogs and Websites. 48. Daily SEO Tip. New Cool SEO tip daily. 49. Distilled. A Team of enthusiastic internet marketers based in London, NYC, and Seattle who aims to help companies grow their businesses online. 51. Google AdWords. The official channel for info and updates from the Google AdWords team. 53. Google AdWords Help Forum. Google Guide for the Adwords Help Forum. 57. Google Webmaster Central. News and resources from Google to help webmasters make great sites. 59. HigherVisibility. Nationally recognized SEO firm that provides tips and discusses the latest topics and trends on the SEO and online marketing space. 60. Hubspot. The world’s #1 inbound marketing software platform. 63. Marketing Pilgrim. Breaking down the latest internet marketing news so you don’t have to. 65. Problogger. Helping bloggers reach their potential, by Darren Rowse. 71. Search Engine Watch. The longest-running SEM industry resource: Google, Bing & search news. Trends, how-tos, opinions, and tips on SEO, PPC, analytics, social media, and content. 72. Search MarketingExpo (SMX). Search Marketing Expo (SMX) is the must attend search marketing conference and expo backed by Search Engine Land & Marketing Land. 73. SEER Interactive. Internet Marketing agency specializing in SEO, PPC, & Analytics with a strong focus on quality results and giving back to the community. 74. SEOBook. We cover the SEO, search marketing space and general changes to the web. 75. SEO Chat. An online forum that is dedicated to helping business owners and marketing specialist perform SEO on their sites. 78. TopRank Marketing. Modern Digital Marketing Agency serving clients & sharing integrated search, social, PR & content marketing news world-wide. 80. Yahoo Search Data. Sifting through millions of Yahoo searches to uncover trends, burning questions, popular personalities and hot ideas. 101. Econsultancy. Econsultancy publishes independent research, analysis and advice on digital marketing, social media, ecommerce, SEO, mobile and tech for businesses. 102. Link Assistant. Pro SEO & SMM tools & software for webmasters, bloggers, SEOs, Social Media Managers & biz owners. We love talking about SEO & SMM. 103. Majestic SEO. We are the worlds most comprehensive source of backlinks information. Our Site Explorer provides Competitor Link Intelligence to SEO specialists. 104. Search Engine People. Canada’s Largest, Most Trusted Inbound Marketing Agency & HubSpot Partner – SEO, PPC, Lead Nurture, Social Media, PR, & More. 105. SEMRush. Service for competitors’ research. We show organic and Ads keywords for any site or domain. Do not forget to follow us on Twitter!